Trollbeads Scarecrow, Witch Shoes and Paradox Review! 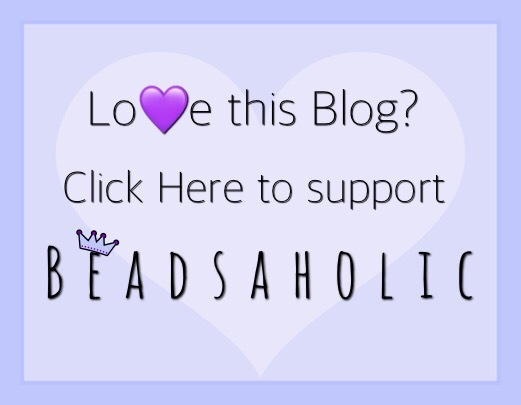 Today Beadsaholic brings a review of Trollbeads Halloween themed beads! Recently Trollbeads released their Autumn collection and in this collection included several beads that are perfect for Halloween! I must say that these three silvers are my favorites from the release, next would be the Trollbeads Ratatoskr though it’s on the small side. At this point this is the first I’ve seen from any brand of a Scarecrow or Witch’s Shoes, so I was particularly excited to see these two beads in this release. The Scarecrow is perfect for the entire Autumn season moving into Halloween and Thanksgiving. I could even see this on a harvest, garden type bracelet during the spring and summer. I’d love a black bird to go along with this bead. The Witch Shoes, I loved from first sight as I love a witchy theme! However, I had some reservations about how they thread onto a bangle and bracelet as I worried in this position they wouldn’t be seen as well. I must say that I do love them, though I may would have preferred that they showed more of the tops of the shoes. They mix well and are cute on a bangle with other witch themed beads, so I’m still rather happy with the design. Above, is one of my favorite combos with the three silvers, Scarecrow, Witch Shoes and Paradox. I love the way Trollbeads Shimmer Royal and Northern Lights Magic gives a sense of the night sky and a bit of a spooky feel to these beads. I was playing around and thought it would be too cute to have the Scarecrow wearing the Witch Shoes, I adore this combo as it’s a lot of fun. I have paired both silvers with the two stones from the Autumn release Hematite and Angel Wing Alunite. Trollbeads Scarecrow can be worn two different ways as you can see in this article. It will also work well as a splitter on a Trollbeads Fantasy Necklace. I love the flowing look of the bottom of the bead and sleeves as I think it adds to the design. Measuring from the hat to the bottom of the bead this bead measures approximately 17.16 mm high and sleeve to sleeve this bead measures approximately 16.14 mm wide. So, I feel though this is not a heavy bead that most will like the size and design of this bead. I personally love this bead and will get a lot of use out of it. Scarecrow retails for $45 / €45 / £40, prices in Europe includes vat. Trollbeads Scarecrow looks great with just spacers! I’m loving the Scarecrow with Trollbeads Festival and Warm Breeze. the soft yellows remind me of hay often used to create scarecrows in a field. As a side note, the scarecrow fits the Ohm Dirty Bangle, but can only be worn like shown below. A stack made of the complete Autumns collection from Trollbeads. For even more fun these beads are really cute on the new Alice Bands. I know the Alice Bands won’t be for everyone, but for myself I’m rather enjoying the styling. I often use hair bands, ties and combs, so for me this is a fun and cool accessory. Price points may not be desirable by some; however, try to remember that the Alice Bands equal the size of possibly two to three bangles. Trollbeads Witch Shoes is a really cute design! I have tons of witch beads, so this concept for me is new and too cool. The shoes are oxidized and have cute silver buckles. I think I would have preferred the hole through the side of the shoes; however, I still love the design and its cute on a bracelet. This bead is on the smaller side as you can imagine with the price point. Witch Shoes measures approximately 13.45 mm from the tip of the shoes to the heel and measures approximately 7.46 mm wide from top to bottom/sole of shoes. Witch Shoes retail for $45 / €45 / £40, European prices include vat. Note, that the Witch Shoes will work perfectly as a pendant on a Fantasy Necklace. The oxidation really adds to the design of the Witch Shoes, so I’m happy Trollbeads went this route with this bead. After seeing the Witch Shoes in the Autumn release, I had to order Ohm Beads Dirty Magic to go along with the Trollbeads Witch Shoes! I am totally in love with these two beads together. As you can see in the following two photos they really go well together! I’ve been wearing this composition the last few days. If you have Dirty Magic from Ohm Beads, then Trollbeads Witch Shoes are a must have! I have paired the two with Ohm Suckers and Dark Soul on an Ohm Dirty Bangle. Another cute nocturnal design is the Paradox with Trollbeads Northern Lights Magic, Shimmer Royal, Foxtail Spacer, and Crown of Leaves. Imagine a beautiful Deadhead Moth flying in the night sky! I am considering ordering a second Paradox as I’d love to use them to frame my Edone Ohm Beads Deathhead Moth. I think this would be an amazing composition. Would be fun to create an all nocturnal bracelet. Trollbeads Paradox has four holes and is an open-works design. This bead can be worn two different ways on a bangle or bracelet and would work great as a splitter on a Fantasy Necklace. You will find the wings as an open-works design with a skull center of one side and a heart center of the other-side. This design reminds me of a nocturnal Deadhead Moth. Paradox is a small bead measuring approximately 10.36 mm from top to bottom of wings and 12.33 mm from the sides of the wings. This bead retails for $35 / €35 / £30, European prices include vat. Moths in general are a favorite for me as they are the nocturnal butterfly. If you know me I’m pretty much a nocturnal creature myself and enjoy all things to do with night. There is beauty in nature whether by sun or by moonlight. “Choose your path – the world is your playground” is the quote used by Trollbeads, this can be interpreted more than one way, but for me maybe it means to choose life and/or death? Love and/or misery? What does it mean to you? Over all, we haven’t seen new Halloween designs from Trollbeads in a while, so for me this was refreshing and my favorite part of this release. I wanted to get this review out first since many of us are concentrating on Autumn and Halloween bracelets. I can personally see myself using these beads quite a bit and have already been wearing the Scarecrow and Witch Shoes daily. Like I mentioned before I think I’d like a second paradox as I’d love to wear it with my Deathhead Moth. I think many of you who love this time of the year will find these beads appealing. The scarecrow can be used as a focal or as part of the overall design. If you would like to shop for any of the new Trollbeads Autumn collection, you may do so at any of the following links! 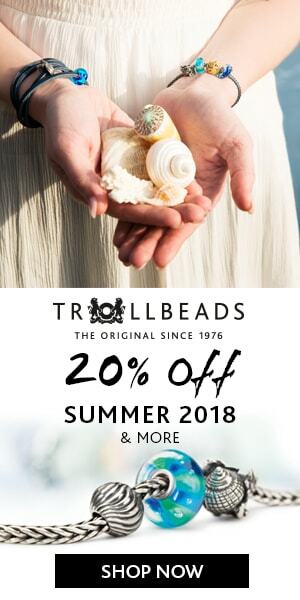 Please note, that banner link for Trollbeads USA is an affiliate link and they currently only ship in the US. All other featured links ship world-wide. Yes, that is the only downfall, I do see why they did it as it’s able to go on the fantasy necklace and a bracelet, but I personally will wear it more on a bracelet. I do love the bead though and happy there are now some witch shoes! I need to put together my witch bracelet. Very cool post. Love the beads!